Dyson revealed the Dyson Cyclone V10 TM cord-free vacuum, which will set the path for vacuum cleaner technology for the next decade. “It’s why we’ve stopped developing corded vacuums”. The new Dyson digital motor V10 is the fastest and most advanced Dyson digital motor, spinning at up to 125,000 rpm and giving the new vacuum the most powerful suction of any cylinder vacuum. Dyson also unveiled the new Dyson Pure Cool™ purifying fans which clean every corner of the room. The machines reveal the indoor pollution you can’t see – new LCD display reports pollutants in the home in real time, and then reacts automatically using a unique Dyson algorithm. The Dyson Pure Cool TM purifying fans feature a 360 degree fully-sealed filter system to capture 99.95% of microscopic allergens and pollutants as small as 0.1 microns. Air Multiplier™ technology and new 350⁰ oscillation project and mix purified air around the whole room. [20th September 2018 – Dubai] Dyson today unveiled the future of clean-home technology: the Dyson Cyclone V10 TM cord-free vacuum, which uses Dyson’s most advanced digital motor yet to combine versatility with Cylinder suction power , and the Dyson Pure Cool™ purifying fans, which bring together Dyson’s expertise in airflow, filtration and electronics to tackle the issue of indoor air pollution and offer owners the only purifier to clean a whole room properly. September 27, 2018: Dyson’s investments in healthier, more hygienic technology date back more than 25 years. With today’s announcement, Dyson builds on its longstanding investments and makes it easier than ever to have a clean home. The new Dyson Cyclone V10 TM cord-free vacuum is built around the Dyson digital motor V10. The new motor allowed Dyson engineers to rotate the cyclones and bin assembly through 90 degrees, into an in-line format. The resulting linear airflow path improves the number of Air Watts of suction by 20% compared to the Dyson V8 TM cord-free vacuum cleaner. It also allows a ‘point and shoot’ bin emptying mechanism for ease of use. And 40% bigger bin capacity , you can clean more of your home and empty less. Floor to ceiling. Then out to the car. Through extensive research and at-home trials over the years, Dyson learned that people often believe they need cylinder machine to properly clean their home and “get the job done”. With the Dyson Cyclone V10TM cord-free vacuum, this is no longer the case — with suction power that’s equivalent to a cylinder , and an optional bigger bin size, you can have the best technology. Not to forget extended runtime plus the added convenience of a light, cordless machine. Separation: The Dyson Cyclone V10 TM cord-free vacuum has no loss of suction – suction performance is constant. Fourteen cyclones are precisely arranged around the central axis of the machine, enabling the airflow inside each cyclone to travel at up to 120 miles per hour, generating over 79,000G, separating even microscopic dust from the air efficiently. Other cyclonic vacuums can be inefficient. Dust and dirt is not efficiently separated from the airflow so it instead ends up on the filter where it chokes the airflow from the motor. Suction drops. Filtration: Dyson engineers have wrapped both the pre- and post-motor filters around the motor as one sealed unit for improved filtration, capturing 99.97% of allergens as small as 0.3 microns – thus releasing cleaner air. Other vacuum cleaners can expel dust, allergens and bacteria into the air you breathe. Energy Storage System: Dyson engineers wanted to deliver enough power to the fast spinning Dyson digital motor V10, while also extending the runtime. So they developed a more energy-dense, without any additional weight. Along with improved electronics and battery system management, the new Dyson Cyclone V10TM cord-free vacuum has up to 60 minutes of fade-free suction . 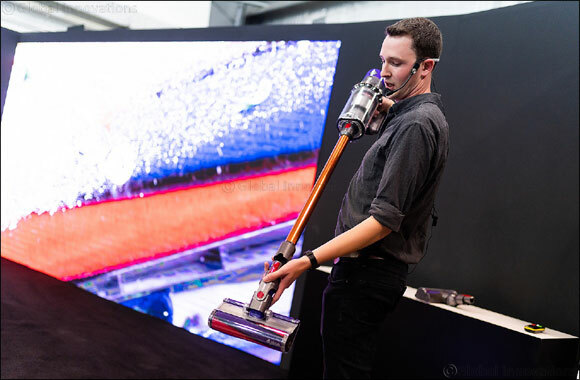 As with other Dyson cord-free vacuums, the machine has a trigger, rather than an on/off switch, – the moment you pull the trigger, the motor starts and accelerates to operating speed in a fraction of a millisecond. Cleaner heads: The machine offers two cleaner heads, one for carpets the other for hard floors. Both have powerful motors located inside the brush bar. One drives stiff nylon bristles deep into carpet pile to remove ground-in dirt and pet hair. The other removes large debris and fine dust from hard floors simultaneously using a larger roller covered in soft woven nylon and anti-static carbon fibre filaments. The Dyson Cyclone V10TM vacuum starts from AED 2599 and is available at www.dyson.ae. The machine includes a 2 year hassle-free warranty on parts and labour. Air pollution is a global conversation, and as awareness rises, attention is moving from outdoor air quality to indoor – where we spend 90% of our time . The World Health Organization has published guidelines for indoor air quality and fact sheets on household air pollution. Dyson’s new purifying fans use intelligent sensors to automatically detect and display, in real time, particles and gases in the home. The invisible is now visible. The machine’s brand new LCD display shows which pollutants are in the air before capturing them using a 360 degree fully-sealed filter system combining an activated carbon filter to remove gases, and a Glass HEPA filter that captures 99.95% of microscopic allergens and pollutants as small as 0.1 microns, and Air Multiplier™ technology and new 350⁰ oscillation for whole room purification. The AHAM AC1-2015 standard sets out how air cleaner manufacturers can define their performance by “the relative reduction of particulate matter suspended in the air in a specified test chamber”. This means their performance is based on cleaning efficiency rates only. We design our purifying fans to go beyond test chamber conditions and focus on real home conditions – this is more than just having an efficient filter. When Dyson engineers set out to design a purifying fan, their research concluded that to clean a whole room properly, you also need to sense pollution events automatically; capture ultrafine pollutants; and project cleaner air around the room using Air Multiplier™ technology. The Dyson purifying fan is designed and tested to do all of this..
Sensing: A new LCD display shows which particles and gases the Dyson Pure Cool™ purifying fan is automatically sensing in real time. A unique Dyson algorithm processes the input from three sensors and then displays air quality readings. Lasers measure and identify ultrafine particles. A separate sensor detects the amount of VOCs (Volatile Organic Compounds, such as benzene and formaldehyde, emitted from paint, burning candles and materials in furniture) and NO2 present. A third sensor measures relative humidity and temperature. Capturing: An improved filter in the new Dyson Pure Cool™ purifying fan captures both particulate matter and gases. Dyson engineers have incorporated 60% more HEPA media into a taller and deeper filter, and they’ve introduced three times more activated carbon, which can absorb gases, odours, domestic fumes and VOCs. Nine metres of condensed and sealed borosilicate microfiber filters capture 99.95% of particle pollution as small as 0.1microns, including allergens, bacteria, pollen and mould. Activated carbon filters, which have been coated with Tris (Trishydroxymethylaminomethane) to increase the absorption efficiency, remove gases including NO2, formaldehyde and benzene. Dyson filters meet the industry standards of EN1822 and H13-A filter class. Projecting: The Dyson Pure Cool™ purifying fan is the only purifier with Air Multiplier™ technology and 350⁰ degree oscillation, allowing it to project clean air to every corner of the room. By expanding the degree of oscillation to 350⁰ degrees and using Air Multiplier™ technology, the machine can project 290 litres of purified air per second to every corner of the room . To avoid a cooling effect in winter, the Dyson Pure Cool™ purifying fan features a unique new diffused airflow mode. Along with the forward airflow mode, which cools you as a fan with purified air, there is now a diffused airflow or purification-only mode, which can be used when you want to purify the air but don’t want cool air blowing on you. Dyson Link app: Available for iOS and Android, the Dyson Link app enables you to track indoor and outdoor pollution, temperature and humidity levels. You can also use it to control your machine and see how many hours of filter life you have left. The new machines come with full Over the Air Update Capability (OTA) – meaning Dyson owners can continue to get the most advanced Dyson software even after purchasing the machine . Engineered for real homes: Dyson purifying fans are designed to work in real homes. Some manufacturers of conventional air purifiers gauge their performance using a laboratory test method called 'Clean Air Delivery Rate'. It is conducted in a compact chamber just 12m2 in size, with an added fan to circulate the air - and only one sensor to measure air quality. It is not representative of the average living room environment. Dyson engineers created a lab test called the POLAR test. It is based on a large living room size, with no added fan. Eight sensors in the corners of the room and one sensor in the centre collect air quality data every 5 seconds, detecting particles of indoor air pollution that are 300 times narrower than a human hair. Analysing the data across all nine sensors lets Dyson engineers ensure the Dyson Pure Cool™ purifying fans deliver a uniform cleaning performance throughout the whole room.